Boba Fett has a present for you! It's that gift-wrapped smuggler, Han Solo! 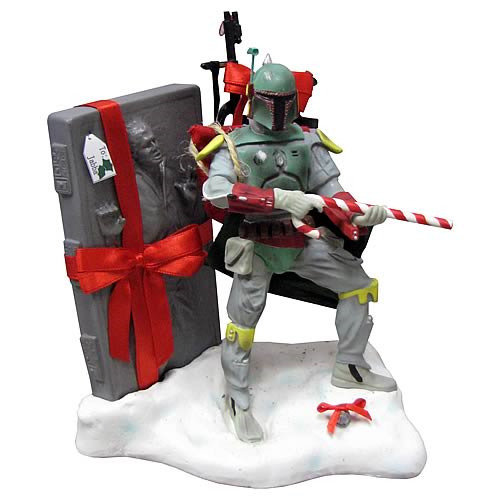 This 8-inch Star Wars statue may be the best holiday decoration ever! Pick one up before Jabba the Hutt gets them all! Boba Fett has a present for you. It's the gift-wrapped smuggler you've always wanted, Han Solo! As the galaxy's most notorious bounty hunter, Boba Fett knows a thing or two about appearances. With the dented armor, intimidating helmet, and a huge array of weapons, he's a force to be reckoned with. Right now, he's cradling a giant candy cane, and you can bet he knows how to use it! Even though Boba Fett wrapped up Han Solo for Jabba the Hutt, he's willing to let you enjoy him, too. This 8-inch fabric-mache statue has amazing detail taken straight from the Star Wars films, plus some festive flair you won't see anywhere else. This is the perfect decoration for your holiday shelf, so pick one up before Jabba gets them all!